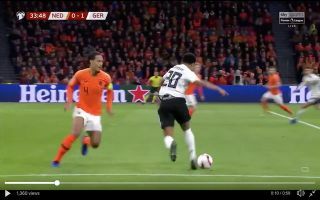 Former Arsenal winger Serge Gnabry scored a sensational solo goal this evening for Germany in their Euros qualifier against Holland, what a strike this is. In the 34th minute of the tie, Gnabry latched onto to an inch-perfect ball over the top by Antonio Rudiger. The Bayern Munich star then drifted in from the left-wing before facing up against Virgil van Dijk, the tricky winger raced past Van Dijk and Denzel Dumfries before curling a sensational strike into the top corner. This is one of Gnabry’s best goals of his career. Serge Gnabry with an absolute cracker for ?? – weaving inside and then belting the ball into the back of the net ?? Gnabry wanted to let fans and viewers know that he’s more than capable of cooking up something special with his goal celebration. Gnabry and Leroy Sane have looked frightening for Germany in the more central attacking role that they’ve been deployed in by Joachim Low tonight.